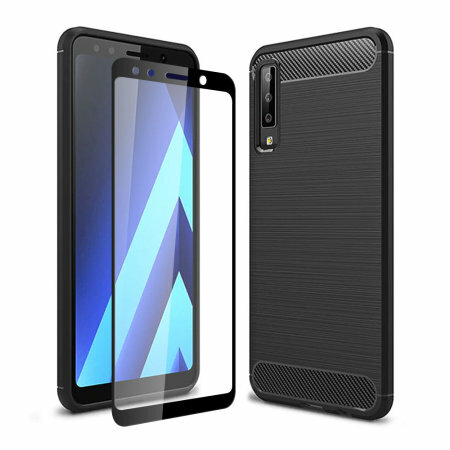 Flexible rugged casing with a premium matte finish non-slip carbon fibre and brushed metal design, the Olixar Sentinel case in black keeps your Samsung Galaxy A7 2018 protected from 360 degrees with the added bonus of a tempered glass screen protector. This cover has saved my phone multiple times. Thin, lightweight, as pictures. I love it. Very good. Neat and easy to apply. I will know how effective it is If I drop the phone! I'm very pleased with this product. It fits the phone very well - is tough, but not overly bulky. Very pleased with how the screen cover fits and works. I have to admit, even though it took longer than expected to arrive. It is superb so far. Both screen protector and case are Excellent quality. It's very stylish and comfortable to use.